Competition closed – AND THE WINNER OF OUR FRENCH WEDDING INVITATION COMPETITION IS …… HANNAH (we don’t have your surname, but you are comment no. 2 on the blog. Thank you for taking the time to enter the competition – Glyn Archer Wedding Designs would like to offer all entrants a 15% discount if you place your order by the end of May with a 40% deposit. 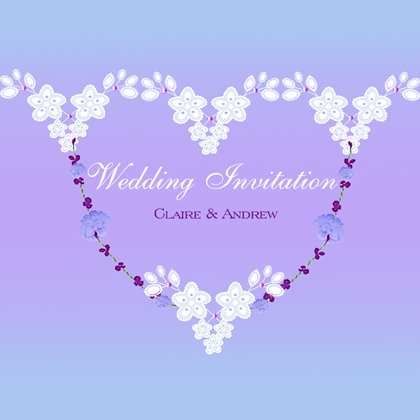 Today I have a wonderful new competition to launch onto the blog, inspired by Claire Pettibone Beau Monde Collection created by Glyn Archer Wedding Designs – Exquisite Stationery for Exceptional Occasions. 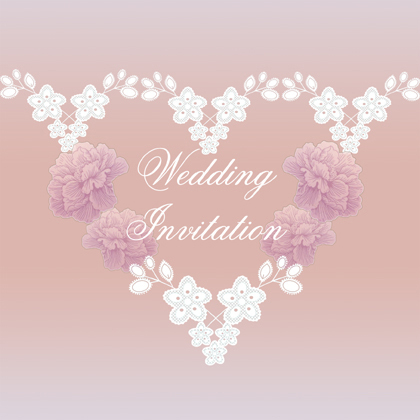 Glyn Archer Wedding Designs are offering the chance for one lucky reader to WIN up to 40 creased square Claire Pettibone Pirouette inspired wedding invitations fully personalised with envelopes worth £180! The Pirouette inspired wedding invitations come in three variations for you to choose which matches to your wedding theme. Glyn Archer Wedding Designs are a small but professional company dedicated to client satisfaction. They love creating unique and beautiful wedding stationery, from the save-the-date cards and invitations right through to your reception items and thank you cards. Glyn ensures that personal touch by working with each bride individually, and she is happy to work within any budget. 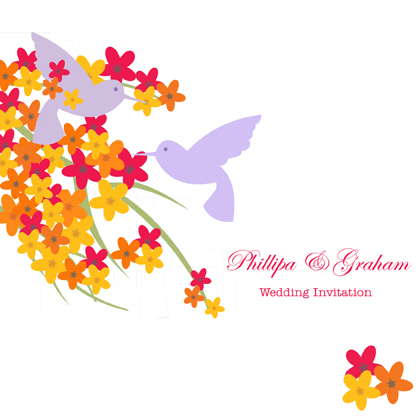 If required, most designs can be customised to reflect the colours of your wedding or she is equally happy to discuss creating a brand new design just for you. 2) Leave me a comment in the comment box below that you have done so and tell me why you want to win the Claire Pettibone Beau Monde inspired invitations. 3) The offer will run until 7th May and the winner will be chosen on that day. 4)For the lucky winner the invites are available between 1st August 2012 and before 31st December 2013. 5) Your details submitted in entering this competition may be maintained for communication purposes, but will not be passed onto any 3rd parties. If you are not lucky enough to win and want to find out more details on Glyn Archers’s beautiful designs visit Glyn Archer Designs. Have liked on facebook and now follow you on Twitter too! 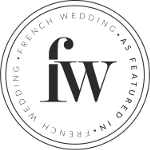 We would absolutely love to win these for our November wedding – a hint of “Frenchness” is just what we need following a romantic proposal on Pont Alexandre in Paris last October. These would go amazingly with our venue and style and we’d love to work with Glyn. Fingers crossed! The invitations are beautiful and so different from anything else I’ve seen. We also got engaged in Paris last year and are looking for an elegant invitation that sets the tone for our day. Also, my Dad’s name is Glyn so it feels like it was meant to be… even if we don’t win. You invites are lovely. would love to win this competition as I have a very small budget and have no ££ for invites!! I would love to win these for a friend ‘Faye’ as she be-friended me when I changed schools nearly 15 years ago. We lost contact years ago due to university but managed to contact each other about 6 years ago and have been mates again like we were before. We live hundreds of miles apart but catch up over facebook or text. She couldn’t have her ideal wedding as it was too expensive but she is scrimping and saving to have the perfect day, which I know she will. Her theme is gold and hearts so these invites would be perfect. It would ease the pressure a little for her. 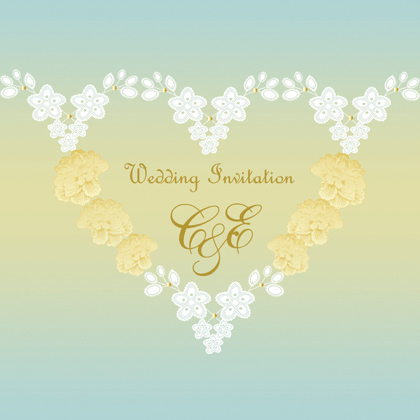 Would love these beautiful invites…we didnt get engaged in Paris or even France but Corfu. Not so romantic so a bit of French class would be gorgeous at our wedding. Have all sorts of family dramas so winning these would be a wonderful boost. These are beautiful invitations, I would love to win them! I’m trying desperately hard not to become a competitive bride as my brother proposed to his girlfriend on the same day I got engaged, but she’s already got so much organised!! I have done nothing! The only thing we’ve decided on is a purple & blue theme so they would fit right in. These would just be perfect for the first thing to tick off the “list”! Thank you for the competition. 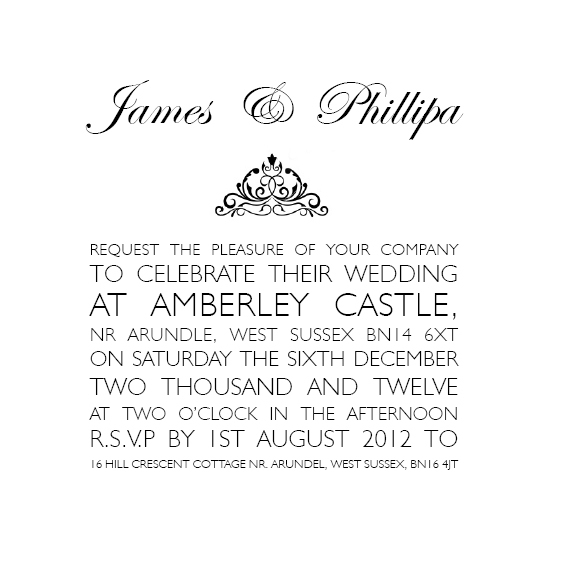 I would love to win the invitations as they perfectly go with my theme which is vintage with a french twist. I have been collecting gorgeous french china and glasses for the event but not thought about invitations yet. I love the vintage feel with fresh french classic design. Simply lovely. Liked on Facebook! look forward to seeing all your updates 🙂 I would love to win wedding invitations! Of course it is a massive save (and we are on a very tight budget!). I think you could do something very exciting with the bluebell / nando’s picnic theme we have in mind! I would like to win these invitations for my son and future daughter-in-law. We are really looking foward to their wedding and this would be a lovely early present for them. For your entry to be valid you must go to http://www.facebook.com/GlynArcherWeddingDesigns and like the page as well as leaving a comment. CONGRATULATIONS to Hannah no 2 comment on the blog!!! Please email info@glynarcher.co.uk so you can start chatting about your colour/text requirements etc. and when your wedding is! 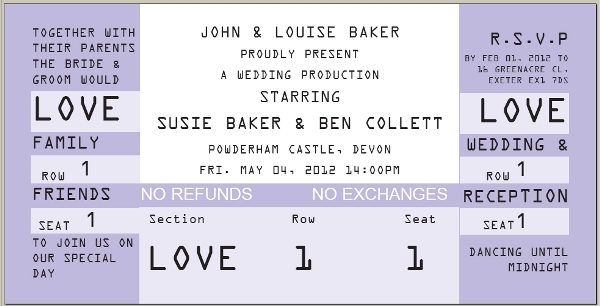 these are lovely designs, the film ticket style is ideal for my daughter’s wedding as she and her fiance are having a vintage film theme for their wedding. I have ‘liked’ the facebook page and winning this competition would be the icing on the wedding cake for a couple who deserve a bit of good luck!